We found 104 results matching your criteria. The Sorrento wood veneer conference table collection is a transitional line of office furniture for executive offices, individual workstations, conference rooms and reception desks. This discount office furniture combines a high-end look with technology-friendly features. The Sorrento conference tables are available in an Espresso Walnut and a Bourbon Cherry finishes. The Bourbon Cherry finish has walnut inlays bordering birds eye maple panels. AA-grade North American Hardwood veneers are used throughout the complete line of Sorrento conference table. The Sorrento Series Conference Room Tables have a matching presentation board available. For tables 12' and longer, REAL Office's patent-pending modular table design is utilized combining starter and adder sections. For tables larger than 30', simply order additional SCA6 adders to build onto a 30' table in 6' increments. Rectangular shaped conference tables are only available in Bourbon Cherry. Boat-shaped conference tables are only available in Espresso. Mayline Sorrento conference room furniture includes conference tables from 6' to 30' featuring hardwood surfaces with high-style design. Sorrento's North American wood veneers combine with intricate walnut inlays in a bourbon cherry or espresso finish creating a stunning result. Sorrento discount office furniture will make a quality statement to your clients and business associates. Mayline Sorrento conference room furniture includes conference tables from 6' to 30' featuring hardwood surfaces with high-style design. Sorrento's North American wood veneers combine with intricate walnut inlays in a bourbon cherry or espresso finish creating a stunning result. Sorrento discount office furniture will make a quality statement to your clients and business associates. The Sorrento Series Conference Room Tables have a matching presentation board available. For tables 12' and longer, REAL Office's patent-pending modular table design is utilized combining starter and adder sections. For tables larger than 30', simply order additional SCA6 adders to build onto a 30' table in 6' increments. Rectangular shaped conference tables are only available in Bourbon Cherry. Boat-shaped conference tables are only available in Espresso. The Sorrento Series Storage Options have a Low Wall Cabinet that has one internal shelf in each compartment that adjusts to 5 different positions on 1 1/4" increments. Does not lock. The Executive Buffet Cabinet has one internal shelf in each compartment that adjusts to 3 positions and 2 1/2"H increments. It does not lock. The Lateral files feature an interlock system allowing only one drawer to open at a time. A Standard gang lock is provided. SLC and SBUF have wood doors (Bourbon Cherry) or frosted glass doors (Espresso). SBQ5 and SB5 have 1" thick shelves. The Sorrento Series Conference Room Tables have a matching presentation board available. For tables 12' and longer, REAL Office's patent-pending modular table design is utilized combining starter and adder sections. For tables larger than 30', simply order additional SCA6 adders to build onto a 30' table in 6' increments. Rectangular shaped conference tables are only available in Bourbon Cherry. Boat-shaped conference tables are only available in Espresso. Mayline Sorrento conference room furniture includes conference tables from 6' to 30' featuring hardwood surfaces with high-style design. Sorrento's North American wood veneers combine with intricate walnut inlays in a bourbon cherry or espresso finish creating a stunning result. Sorrento discount office furniture will make a quality statement to your clients and business associates. Mayline Sorrento conference room furniture includes conference tables from 6' to 30' featuring hardwood surfaces with high-style design. Sorrento's North American wood veneers combine with intricate walnut inlays in a bourbon cherry or espresso finish creating a stunning result. Sorrento discount office furniture will make a quality statement to your clients and business associates. The Sorrento Series Conference Room Tables have a matching presentation board available. For tables 12' and longer, REAL Office's patent-pending modular table design is utilized combining starter and adder sections. For tables larger than 30', simply order additional SCA6 adders to build onto a 30' table in 6' increments. Rectangular shaped conference tables are only available in Bourbon Cherry. Boat-shaped conference tables are only available in Espresso. The Sorrento Series Low Wall Cabinet has one internal shelf in each compartment that adjusts to 5 different positions on 1 1/4" increments. It does not lock. Presenting an open and shut case for good business: The next generation of flexible desktop power and data solutions for multi-media conference room settings. These PME2X convenience outlets are designed with a lid that function as cable management portal that can be closed while in use. The Sorrento Series Presentation Board has a white dry-erase board center panel (45" x 45"). The sculpted lower tray holds markers, erasers, etc. It features a magnetic, non-ghosting surface, and tackable light tan interior door inserts. It also has a full-height brass hinge. This portable power and data distribution product brings technology safely from the wall to where you need it. Scalable in length and power configurations (2-6 outlets), this unit transfers power and routes cables in a safe to walk-on, robust and low profile design (only 1/2' thick), fit for any environment. Presenting an open and shut case for good business: The next generation of flexible desktop power and data solutions for multi-media conference room settings. These PME2X convenience outlets are designed with a lid that function as cable management portal that can be closed while in use. Look what's popping now: The next generation of flexible desktop power and data solutions for executive and institutional work station applications. Retractable and durably constructed, These Modular High Output wire management modules are highly functional with a fluid one touch door that remains open during use. Presenting an open and shut case for good business: The next generation of flexible desktop power and data solutions for multi-media conference room settings. These retractable PME2X convenience outlets are designed with a lid that function as cable management portal that can be closed while in use. Look what's popping now: The next generation of flexible desktop power and data solutions for executive and institutional work station applications. Retractable and durably constructed, These Modular High Output wire management modules are highly functional with a fluid one touch door that remains open during use. Look what's popping now: The next generation of flexible desktop power and data solutions for executive and institutional work station applications. Retractable and durably constructed, These Modular High Output wire management modules are highly functional with a fluid one touch door that remains open during use. Look what's popping now: The next generation of flexible desktop power and data solutions for executive and institutional work station applications. Retractable and durably constructed, These Modular High Output wire management modules are highly functional with a fluid one touch door that remains open during use. Presenting an open and shut case for good business: The next generation of flexible desktop power and data solutions for multi-media conference room settings. These PME2X convenience outlets are designed with a lid that function as cable management portal that can be closed while in use. Look what's popping now: The next generation of flexible desktop power and data solutions for executive and institutional work station applications. Retractable and durably constructed, These Modular High Output wire management modules are highly functional with a fluid one touch door that remains open during use. Presenting an open and shut case for good business: The next generation of flexible desktop power and data solutions for multi-media conference room settings. These retractable PMHO2 convenience outlets are designed with one touch double doors that function as cable management portals that close while in use. Portable Power Strip - 6 Power Outlets - Wire Management - 72"
This portable power and data distribution product brings technology safely from the wall to where you need it. 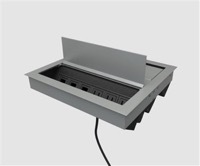 Scalable in length and power configurations (2-6 outlets), this unit transfers power and routes cables in a safe to walk-on, robust and low profile design (only 1/2" thick), fit for any environment. Presenting an open and shut case for good business: The next generation of flexible desktop power and data solutions for multi-media conference room settings. These PME2X convenience outlets are designed with a lid that function as cable management portal that can be closed while in use. Presenting an open and shut case for good business: The next generation of flexible desktop power and data solutions for multi-media conference room settings. These retractable PMHO2 convenience outlets are designed with one touch double doors that function as cable management portals that close while in use. Presenting an open and shut case for good business: The next generation of flexible desktop power and data solutions for multi-media conference room settings. These PME convenience outlets are designed with a lid that function as cable management portal that can be closed while in use. Portable Power Strip - 6 Power Outlets - Wire Management - 48"
This portable power and data distribution product brings technology safely from the wall to where you need it. Scalable in length and power configurations (2-6 outlets), this unit transfers power and routes cables in a safe to walk-on, robust and low profile design (only 1/2' thick), fit for any environment. Presenting an open and shut case for good business: The next generation of flexible desktop power and data solutions for multi-media conference room settings. These PME convenience outlets are designed with a lid that function as cable management portal that can be closed while in use. Presenting an open and shut case for good business: The next generation of flexible desktop power and data solutions for multi-media conference room settings. These retractable PME convenience outlets are designed with a lid that function as cable management portal that can be closed while in use. Save up to 70% on Sorrento Conference Tables, office furniture, executive desks, lateral files, and reception desks. You will also receive FREE SHIPPING on all of our discount office furniture.